As spring starts, travel starts to pick up. Data shows that United States travel to overseas markets is up two percent in 2014. As more individuals plan to travel overseas, it is important to make sure that you pack all of the right equipment. When traveling overseas be sure to pack a voltage converter. A voltage converter changes the voltage of a power source. It is important to pack a voltage converter when traveling abroad because the electrical devices you bring with you will not work in the electrical outlets in other countries. Different countries have different electrical outputs. In order to not fry your electrical equipment, you will need to purchase a voltage converter in order to charge and use your electronic equipment while traveling abroad this spring. If you will be traveling with CD players, mobile phones, electric shavers, laptops, or Mp3 players, you will need to purchase at least a 200 Watt step down travel size voltage converter. This will convert 220/240V down to 110/120V and will allow you to use United States products in 220V countries. 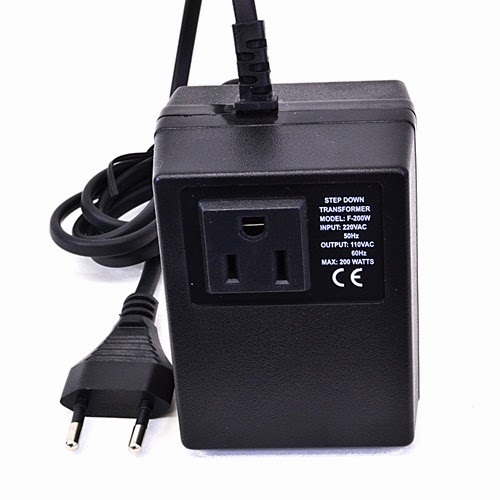 However, 200W travel converters are not recommended for heating products such as hair dryers, straighteners and curling irons. If you will be traveling with heating products, you will need to purchase a 1600 Watt step down travel voltage converter. This is a small size travel convertor that will allow you to 220/240V to 110/120V. It will change a United States flat two prong plug into two round prong European plug. It is not intended for continuous use though, so be sure to unplug the voltage converter when not in use. Please contact us, the experts at Bombay Electronics, to assist you in purchasing the correct voltage converter for your travel needs. We can make sure that the converter you choose matches your needs and will work in your country of destination.